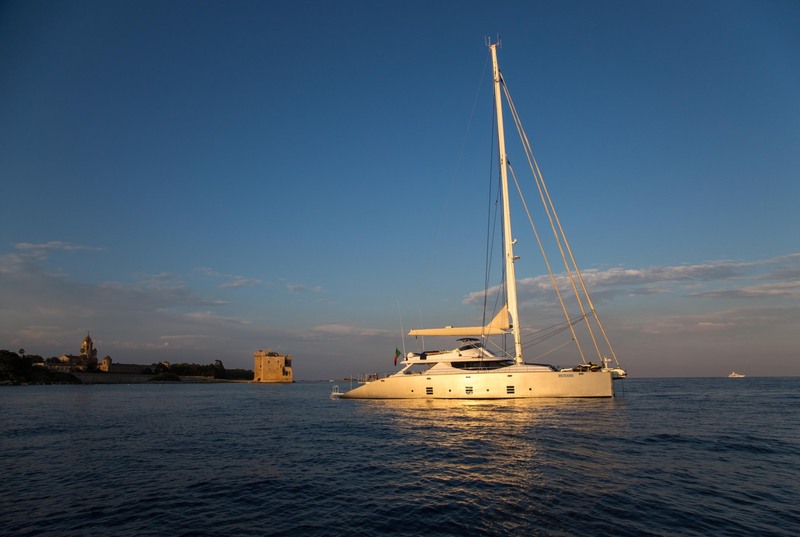 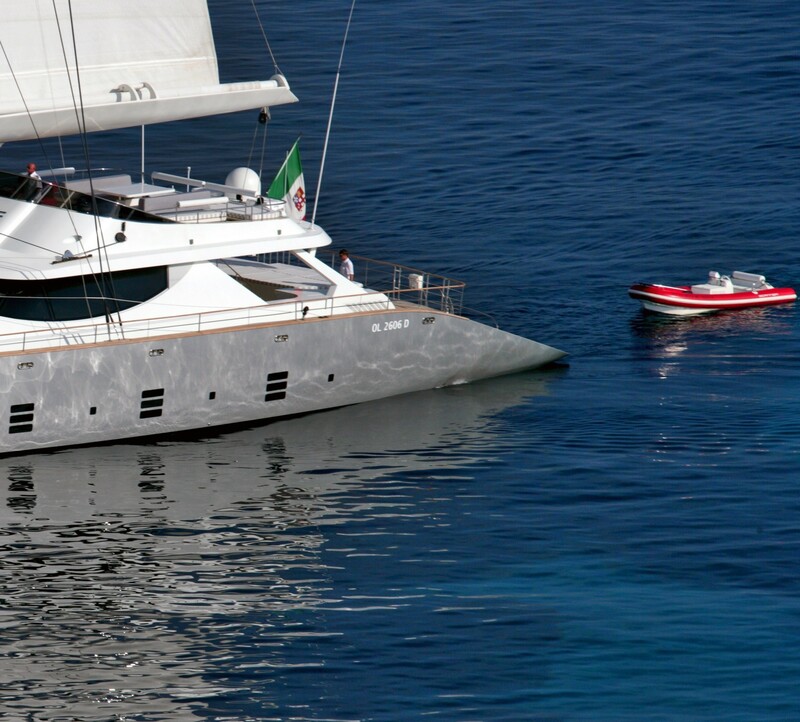 Catamaran HUTIANE (ex LA SELLA DEL DIAVOLO) is a 31m (101'8'') sailing catamaran featuring naval architecture and exterior design by Olivier Racoupeau, with design by BRYD and was built by Cuneo Marine in Trieste in 2011. 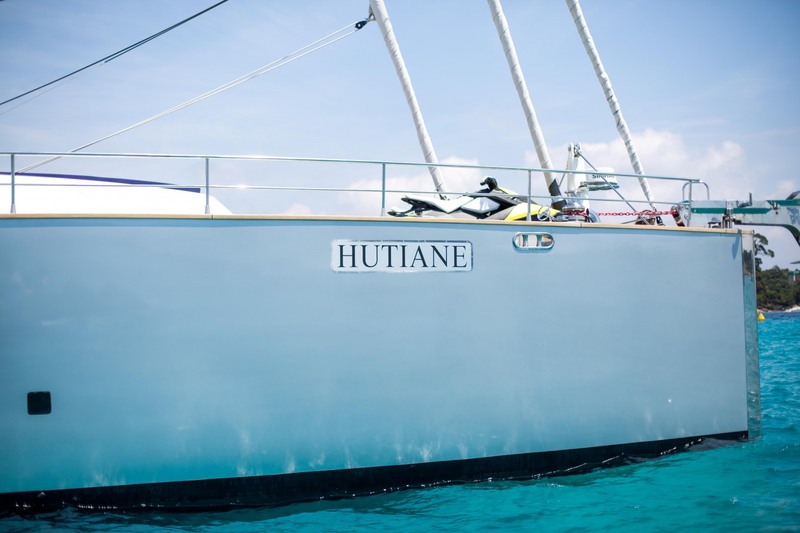 The yacht HUTIANE was designed for size, sailing comfort, stability and grace. 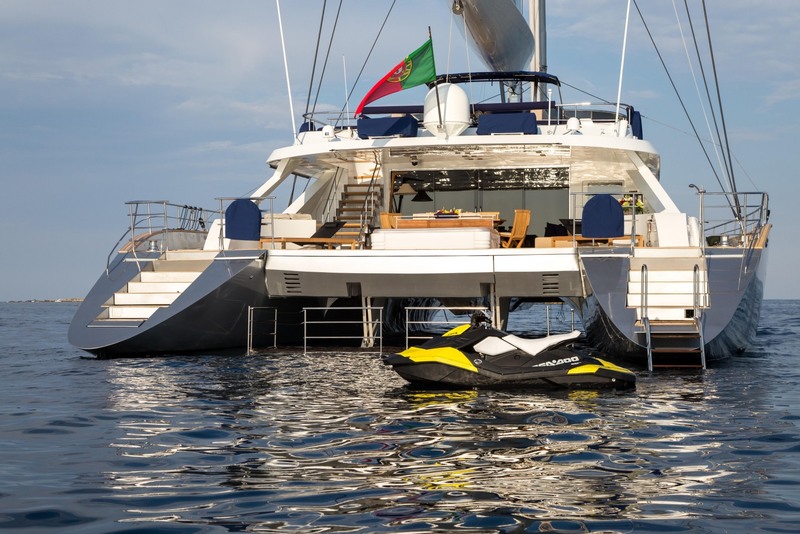 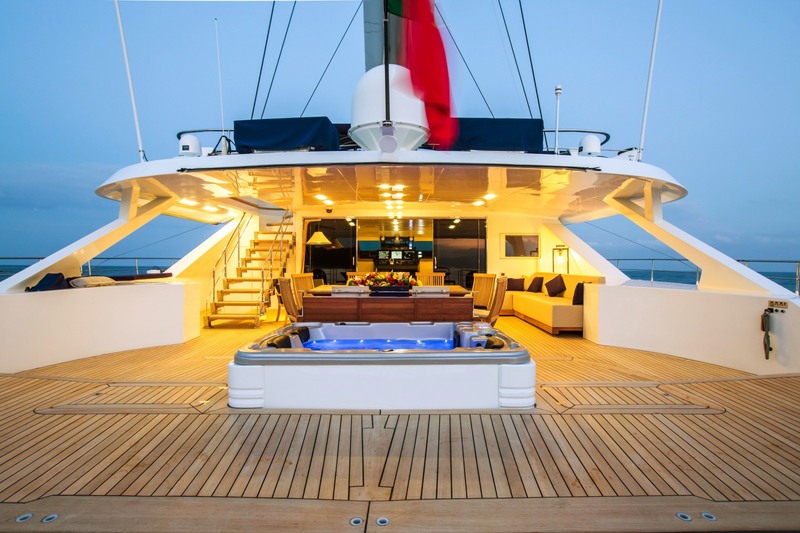 This innovative catamaran measuring 29,20m (96 ft) with a 12.3 m (40.35ft) beam offers incredible space that has, until now, been reserved for much larger yachts. 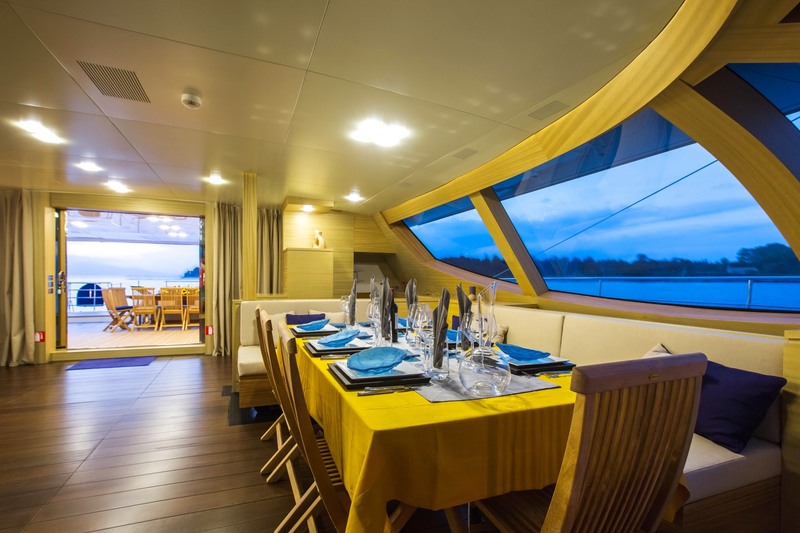 Yacht HUTIANE features a grand saloon with panoramic views and plenty of room to relax, watch a movie or drink a cocktail and offers interior dining for seven-eight charter guests. 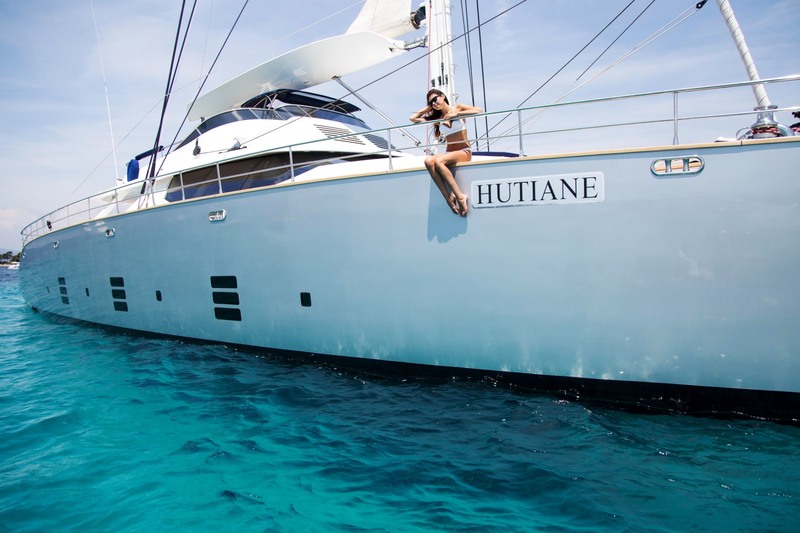 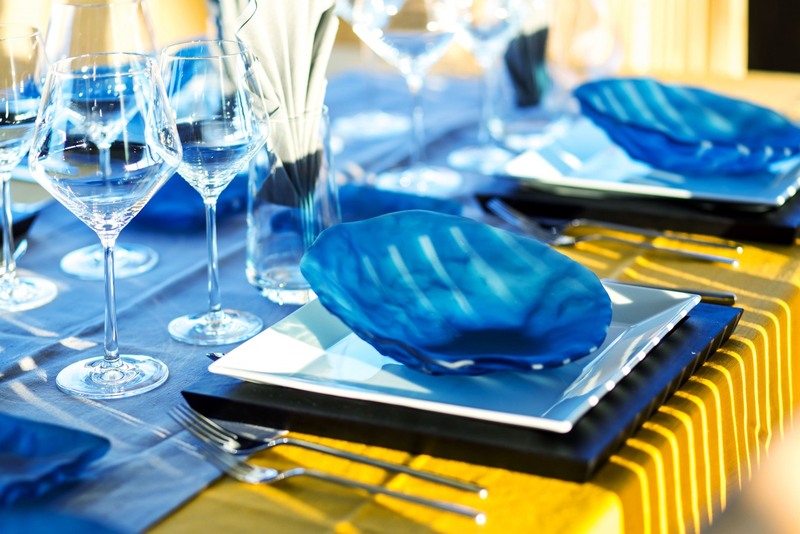 S/Y HUTIANE can comfortably accommodate 10 guests in 4 staterooms and has a professional crew of five to cater to every desire. 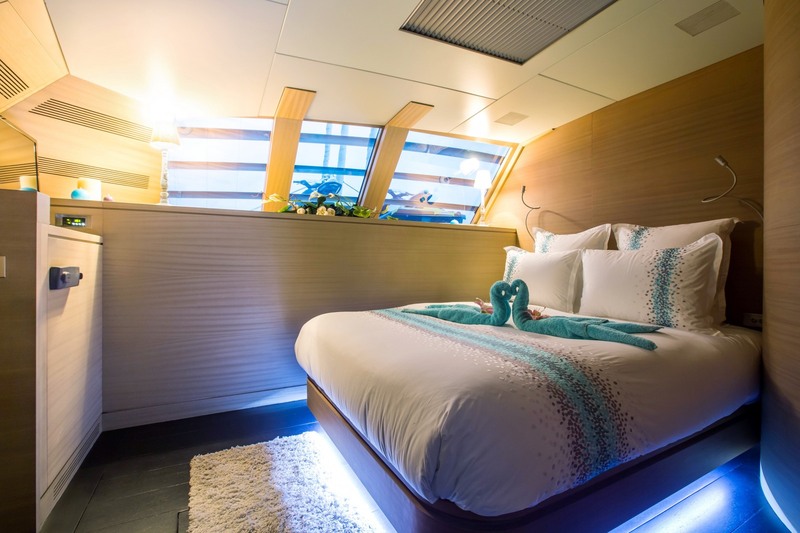 Her huge master stateroom offers 180 degree views over the bow of the yacht and is beyond. 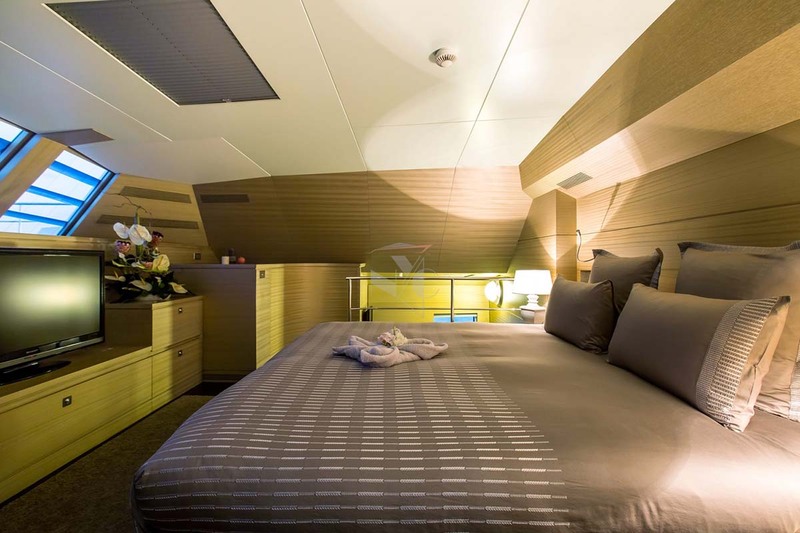 The master stateroom offers also a third berth ideal for a child, on the lower level, and a spacious bathroom with hammam. 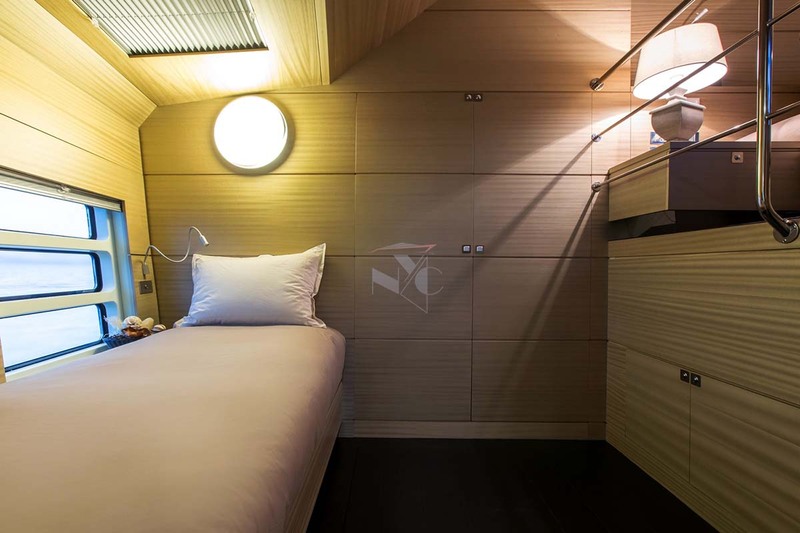 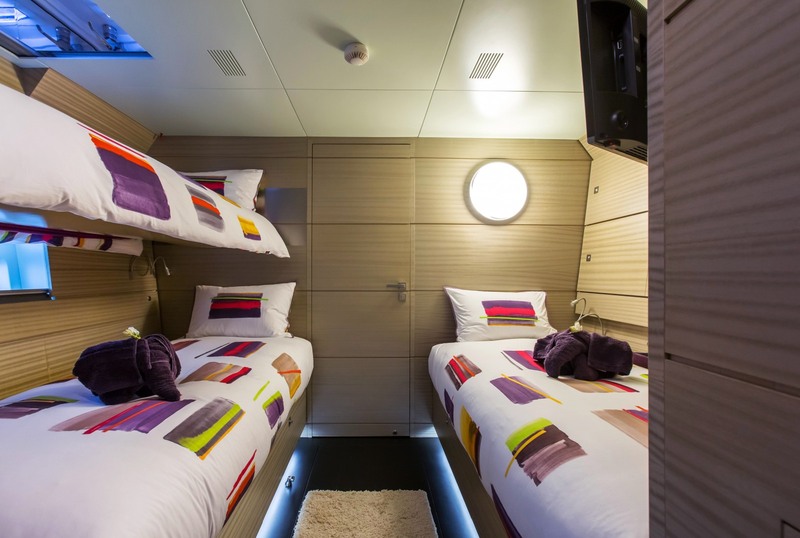 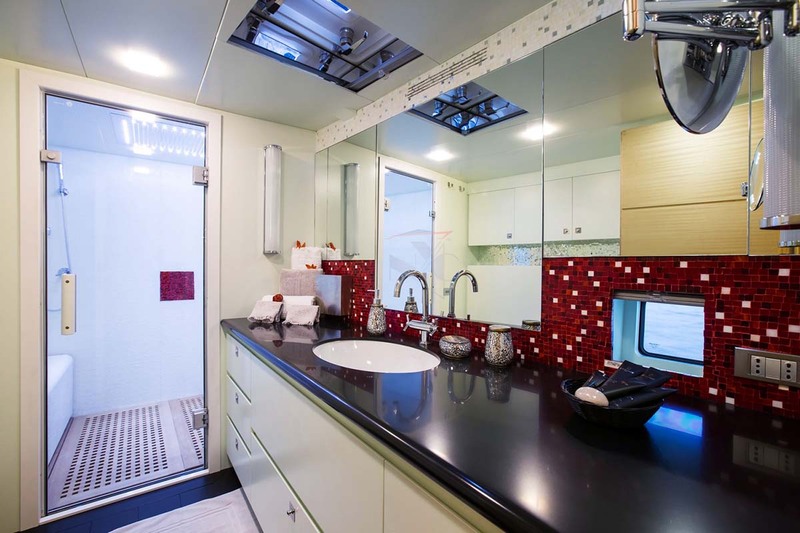 The two remaining guest cabins are located in the starboard hull are smaller than the master cabin but still spacious and very comfortable and with en-suite bathrooms. 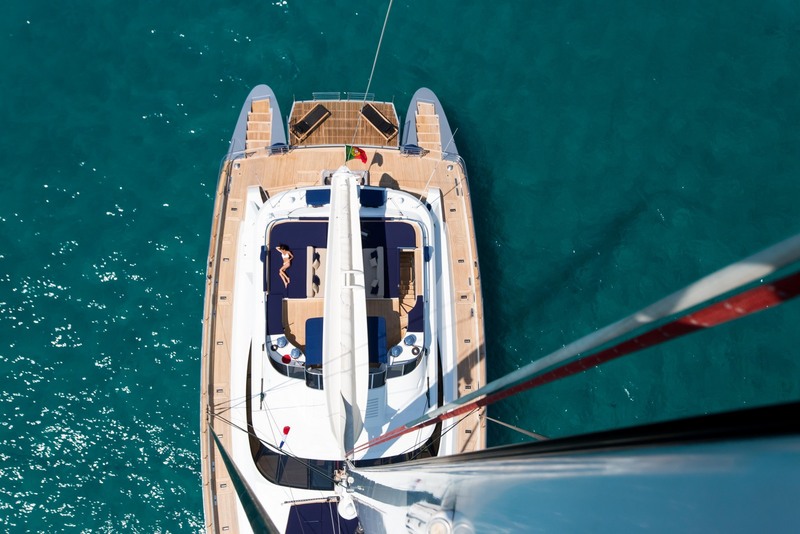 To offer maximum privacy, the port hull is reserved for crew and all sail handling is carried out on the flybridge, leaving the main deck and starboard hull completely private. 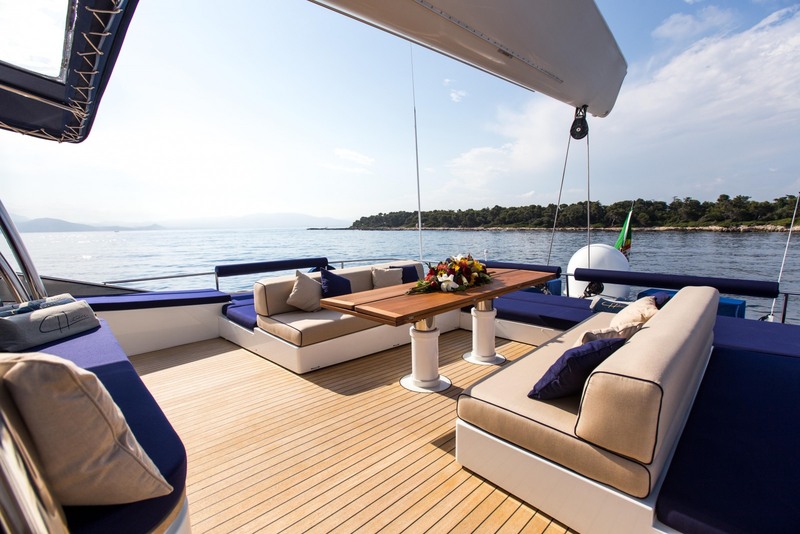 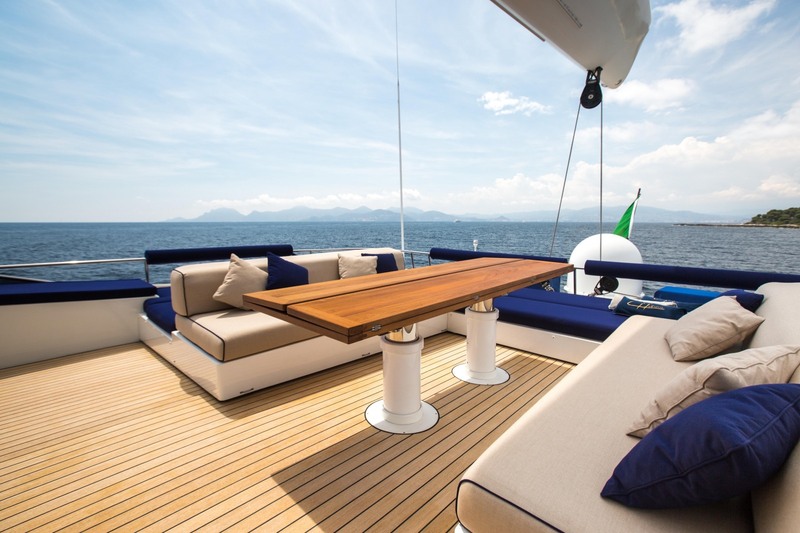 Being such a large sailing catamaran, the HUTIANE (ex LA SELLA DEL DIAVOLO) yacht offers superior entertaining space and deck areas. 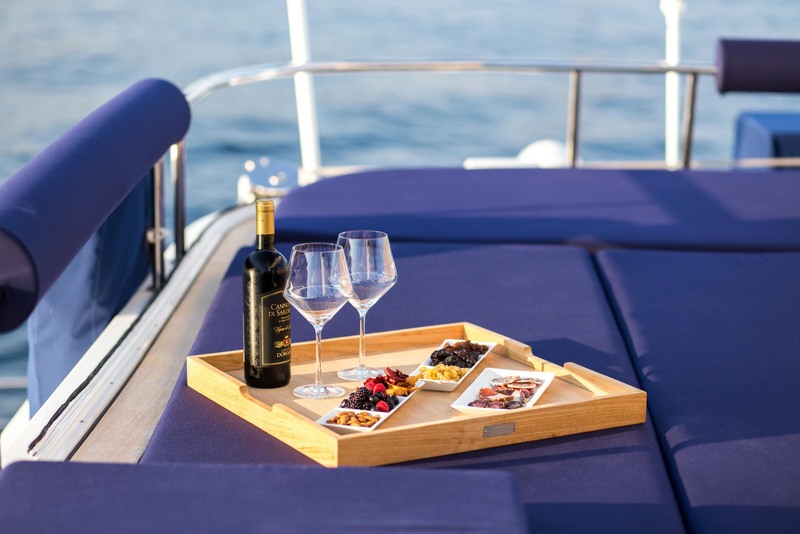 The aft deck exterior saloon is a great social gathering area boasting a large shaded terrace with a lounge area, an al-fresco dining area and a spacious sunbathing area. 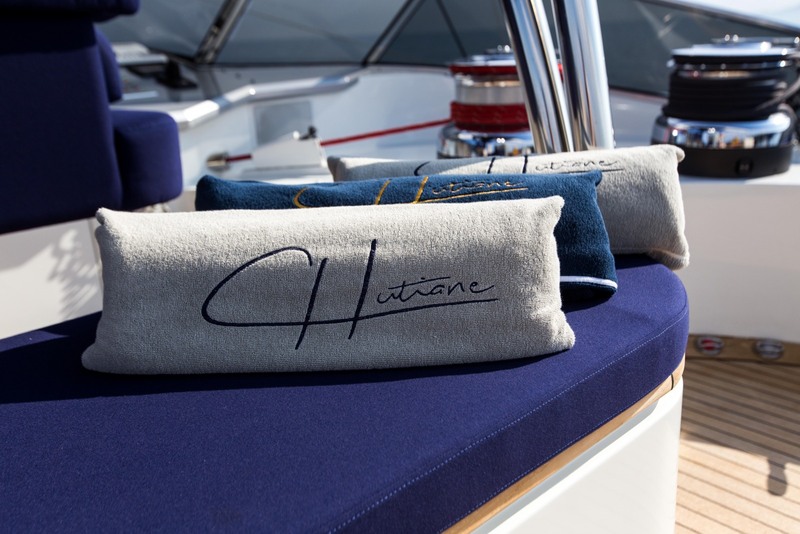 Sailing yacht HUTIANE has a large bulwark that protects the bridges and allows fully safe passage around the yacht. 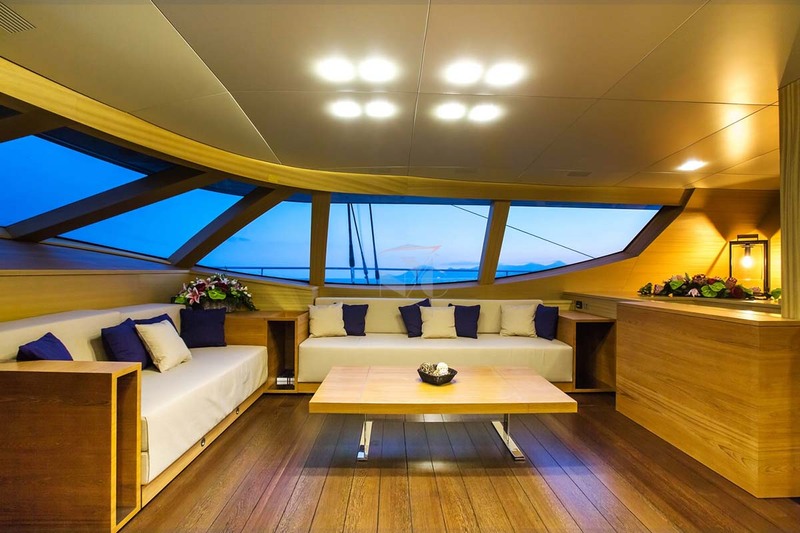 The foredeck is expansive and impressive and the nets are a great place to relax while sailing with the water rushing by below you. 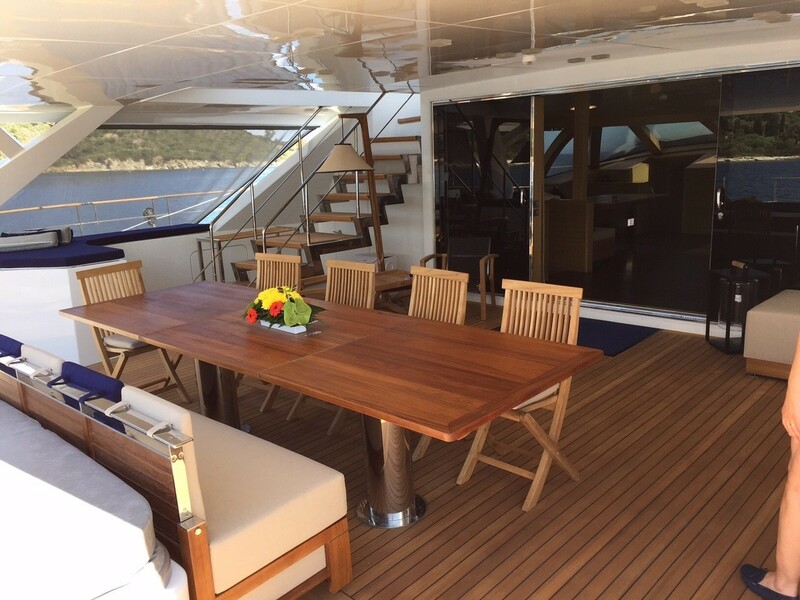 Access to the flybridge is made from aft terrace. 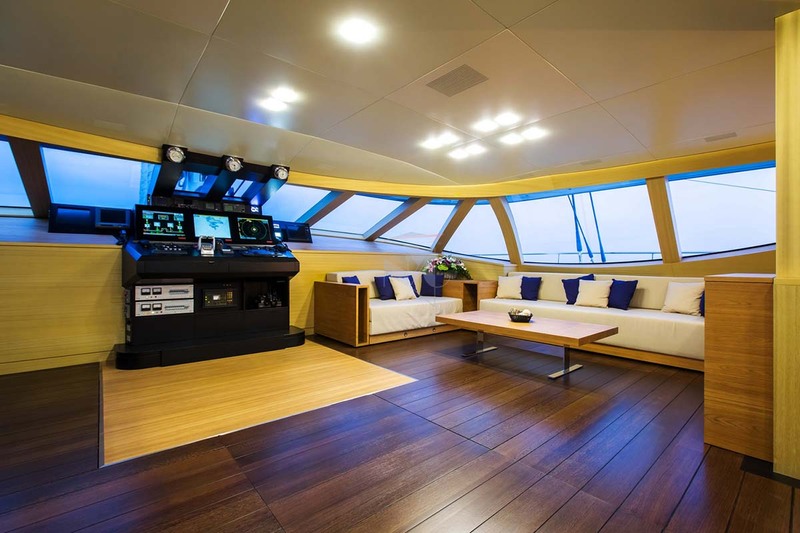 This popular guest area offers plenty of space to relax privately while on anchor. 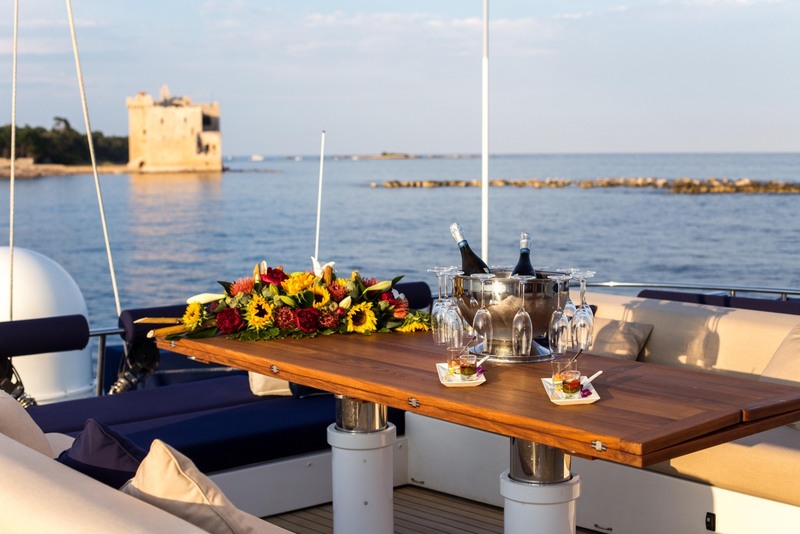 The large flybridge houses a navigation area forward with a relaxation area for cocktails and al fresco dining, a bar and a BBQ area, accessed by a dumbwaiter the galley. 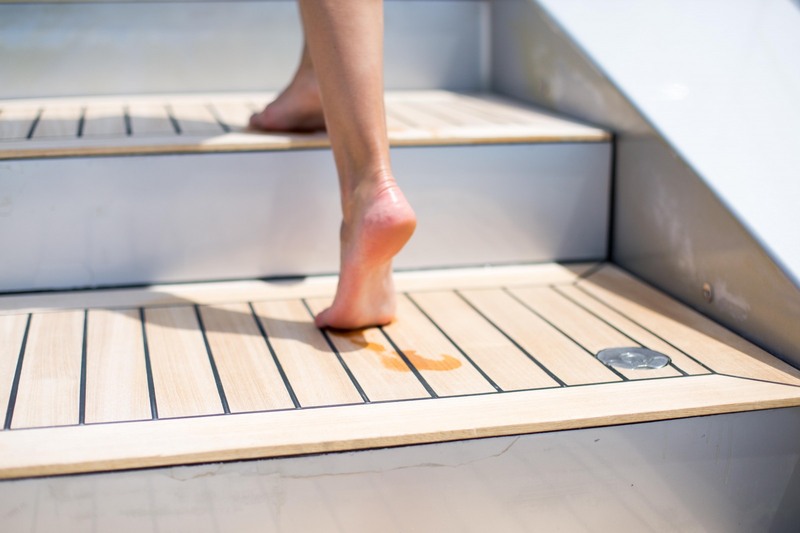 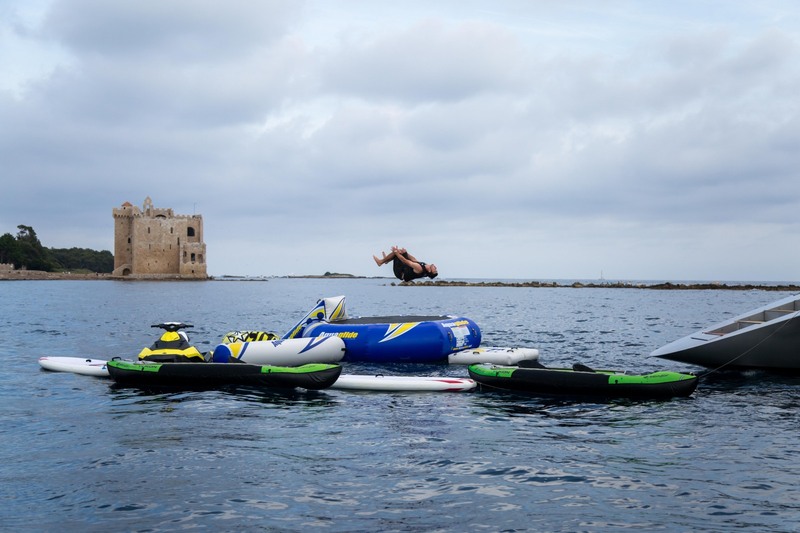 The stern platforms are ideal for swimming off or enjoying water sports toys. 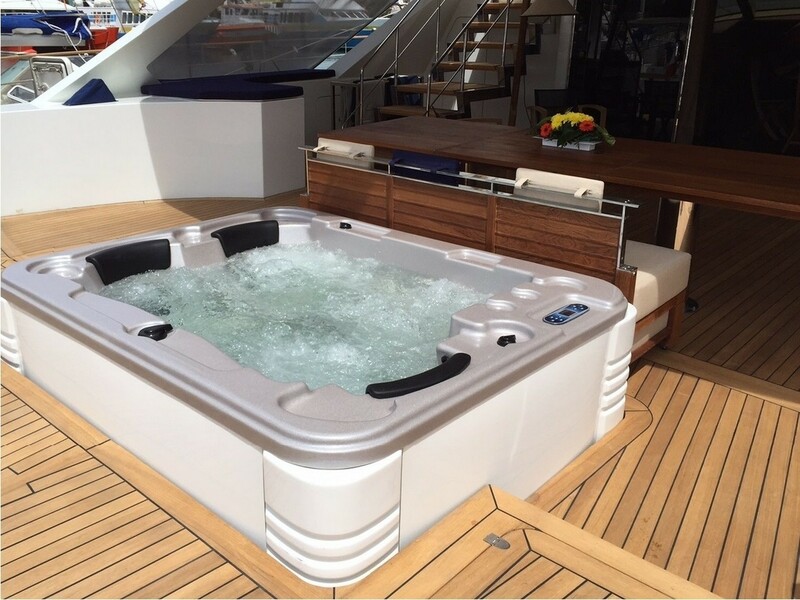 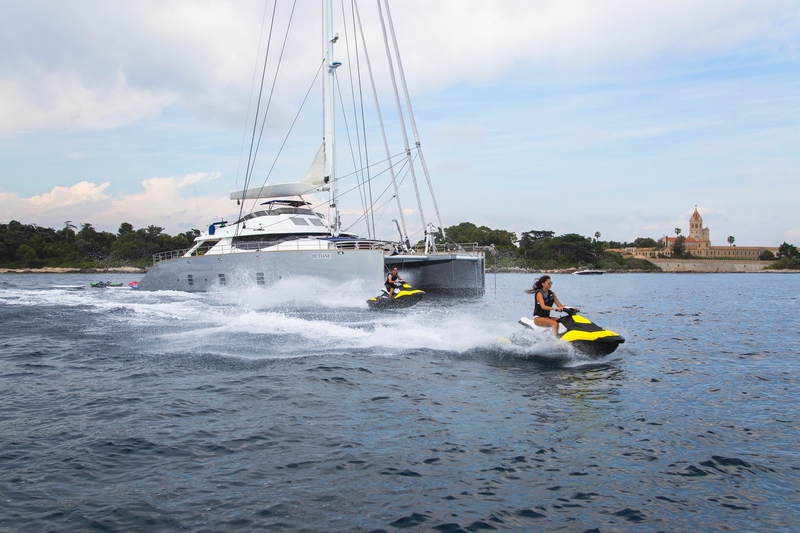 The large dinghy with inboard diesel is stored under the relaxing area and does not disturb the eye. 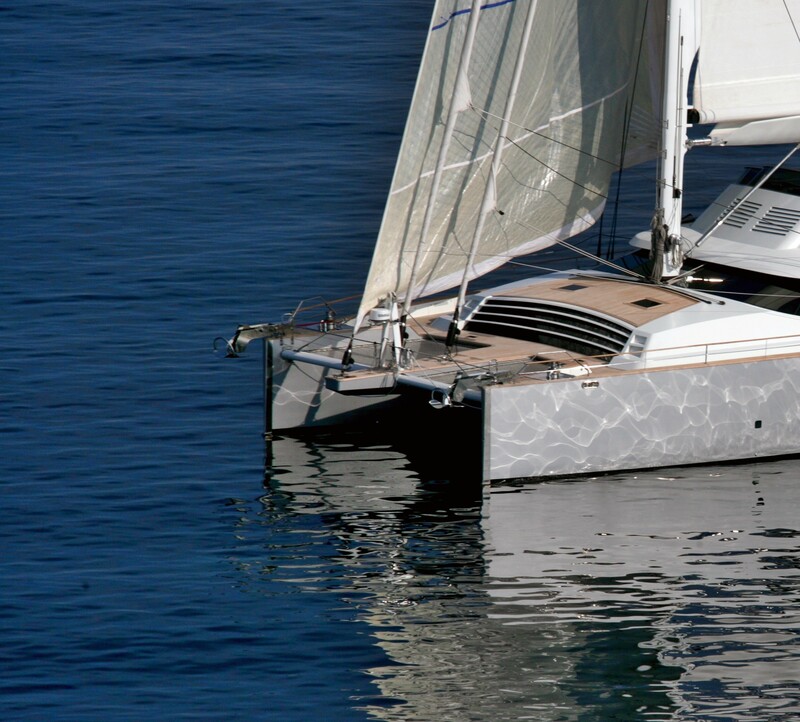 Her mast and boom are out of carbon fiber, with an electrically furled main into the boom. 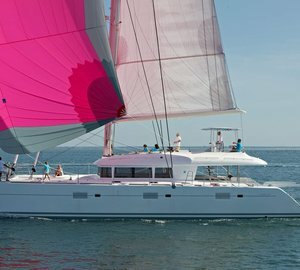 All foresails are hydraulically furled, also the Code zero. 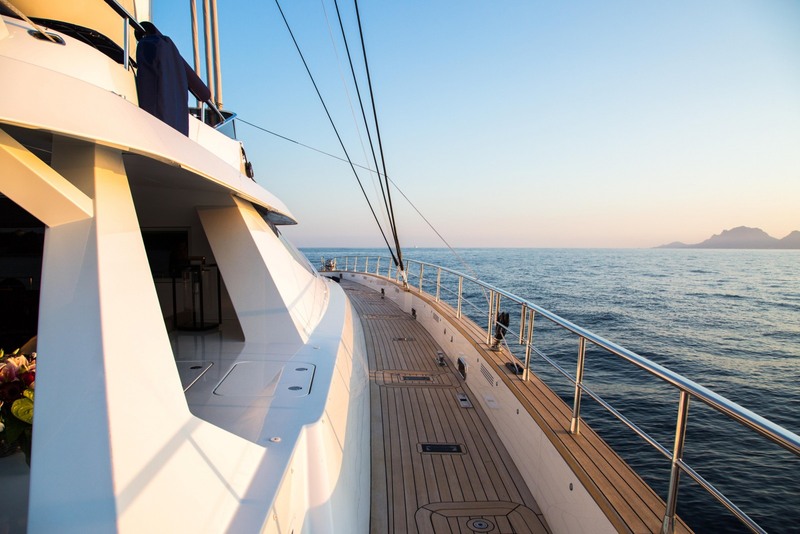 All standing rigging is in Kevlar and running rigging in Spectra. 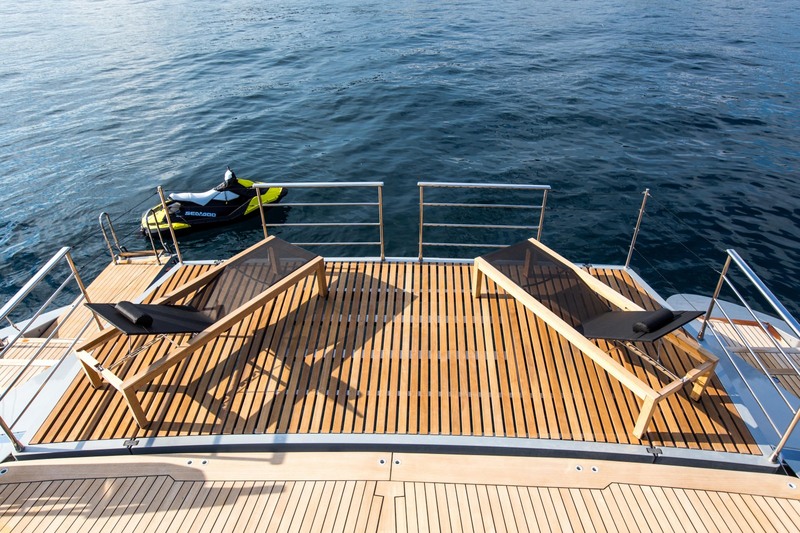 The anchors are recessed in the hulls and hydraulically operated for aesthetical purposes. 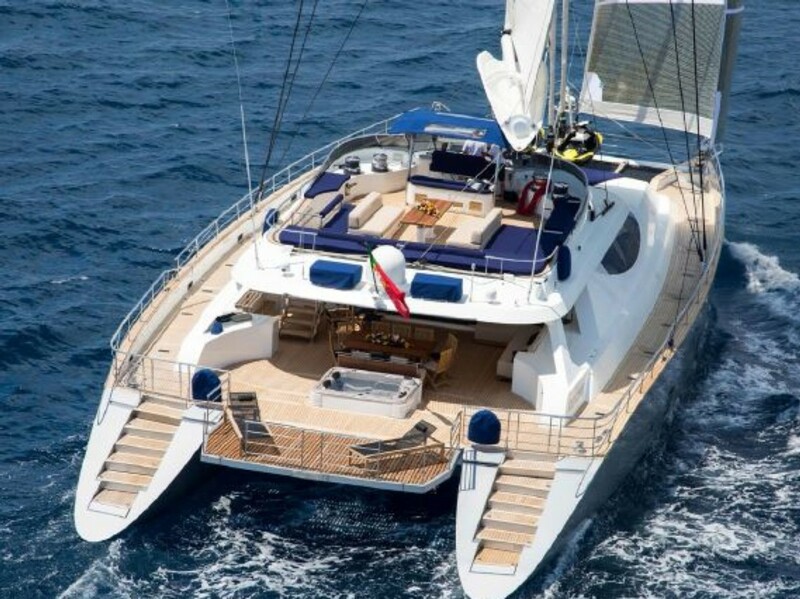 She offers Italian design and luxurious comfort, coupled with speed and volume that is unmatched in the world of sailing yacht catamarans. 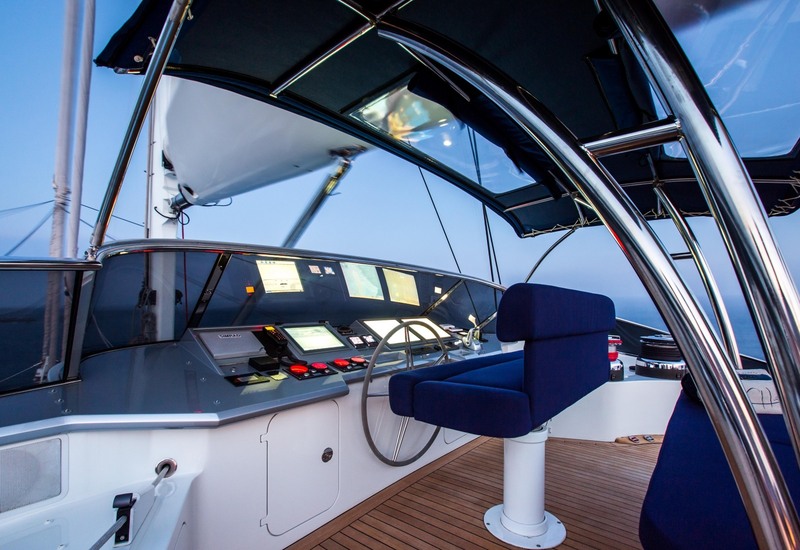 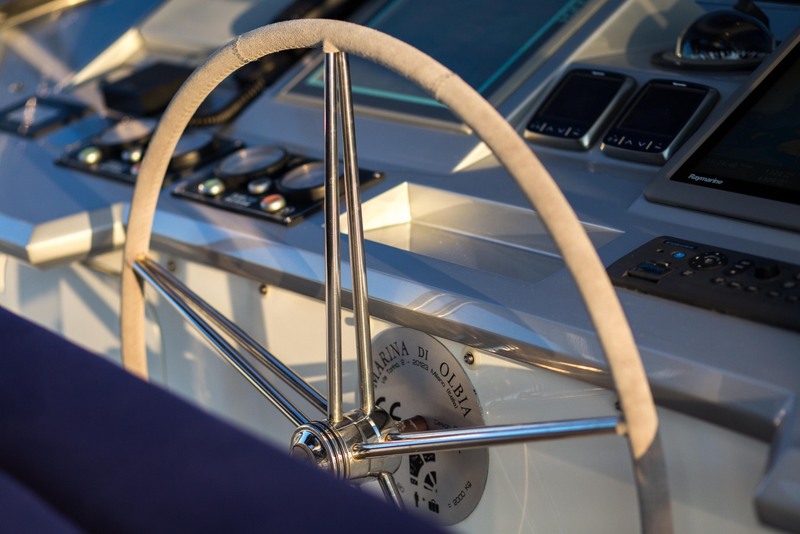 SAFETY is guaranteed by the highest standards present on the charter market, in compliance with the British MCA regulations, providing detailed specifications for onboard equipment, in addition to a fully equipped first aid kit.